Black rice is full of the same antioxidants found in blueberries, grapes and acai. 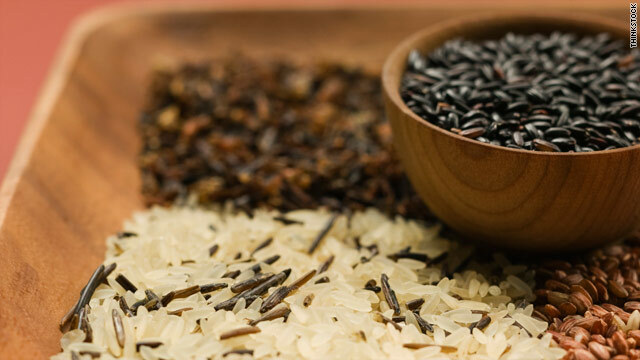 (Health.com) -- According to ancient Chinese legend, black rice was so rare, tasty, and nutritious that only the emperors were allowed to eat it. Times have changed. Although black rice is still relatively rare, researchers are trying to bring its distinctive flavor and mix of antioxidants to the masses -- or at least to a grocery store near you. If you've never heard of black rice, much less seen it, the dark-hued grain is now available at supermarkets such as Whole Foods and appears to be gaining a foothold in kitchens and restaurants in the U.S.
Like brown rice, black rice is full of antioxidant-rich bran, which is found in the outer layer that gets removed during the milling process to make white rice. But only black-rice bran contains the antioxidants known as anthocyanins, purple and reddish pigments -- also found in blueberries, grapes, and acai -- that have been linked to a decreased risk of heart disease and cancer, improvements in memory, and other health benefits. One spoonful of black-rice bran -- or 10 spoonfuls of cooked black rice -- contains the same amount of anthocyanin as a spoonful of fresh blueberries, according to a new study presented today at the American Chemical Society, in Boston. "I think the black-rice bran has an advantage over blueberries, because blueberries still contain a high level of sugar," says the lead researcher, Zhimin Xu, Ph.D., an associate professor at Louisiana State University Agricultural Center, in Baton Rouge. Black rice isn't currently grown on a commercial scale in the U.S., but Xu hopes that his research will spur farmers in the Southeast to start growing it. The combination of antioxidants found in black rice packs a one-two punch that could make it a particularly good food for your health. Some antioxidants in black (and brown) rice are fat-soluble, while anthocyanins are water-soluble and can therefore reach different areas of the body, says Joe Vinson, Ph.D., a professor of chemistry at the University of Scranton, in Pennsylvania. Black rice is still a niche product, but its popularity seems to be growing. "I have to order it [from our supplier] a lot more often than I used to, that's for sure," says Linda Barry, the manager of Barry Farm Foods, a food distributor in Wapakoneta, Ohio, that began carrying black rice about three years ago. Lotus Foods -- which first introduced black rice to the U.S. market in 1995 -- has seen steadily increasing sales as well, says Caryl Levine, the co-owner of the El Cerrito, California-based company. Levine has been a believer ever since she tried her first bowl of steaming black rice in China. "I loved the taste and texture, and the color," she says. "You get this up-front nutty taste, and almost a hint of fruit or floral at the finish. It's very complex." The taste won't win everyone over. The notoriously finicky American palate may be the biggest obstacle facing black rice, says Marisa Moore, R.D., a national spokesperson for the American Dietetic Association. Because the health benefits of black rice lie in the bran, it's important to choose whole-grain varieties when shopping. As with brown rice, Moore suggests, you should look for "whole black rice" at the top of the ingredients list. There are other ways of using the rice besides eating it straight. Levine makes homemade black-rice bran powder by putting the dried kernels in a coffee grinder. A dusting of the powder on fish or in pancakes adds a nice flavor boost, she says. Use enough of it, and the powder will add a distinctive purplish hue. In fact, if black-rice cultivation grows in scale, powder from the rice bran could be used as a healthful food coloring in sodas and other products, Xu says. Even if black rice becomes a staple on your dinner table, you should still make room in your diet for fruits like blueberries, cranberries, and raisins, Moore says. Blueberries and black rice "have different offerings," she points out. "With the blueberries, you get an additional amount of vitamin C."